Technical Insight - BTS With Simon Stock on his 53 Gigapixel Bentley Shoot. Simon Stock is an automotive photography specialist, shooting for many of the World's premier motoring brands. After shooting cars for many years it would be easy to think that Simon had covered every conceivable way to photograph a motorcar, that is until very recently when Simon undertook a commission to create an industry first, the World's largest ever car advertising photograph to promote Bentley’s commitment to innovation and to explore the detail of Bentley’s craftsmanship. 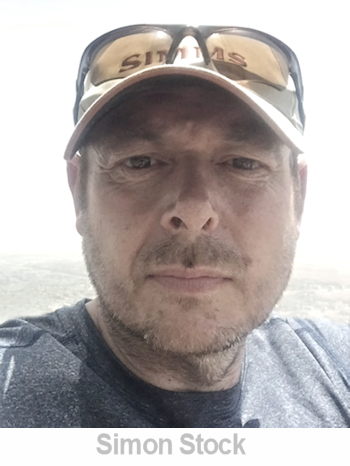 Simon gives us a behind-the-scenes look at how he used NASA technology to create one giant 53 gigapixel image, the size of a football pitch, for a unique advert. How did the idea for this shoot come about? The idea for this Brand Campaign came from “Be Extraordinary” which is the Bentley philosophy. Keko London, the advertising agency wanted to make the most extraordinary car image to showcase ground breaking technology and its fine craftsmanship. The challenge was to create an experience that could transport the viewer from the epic world of panorama pictures to the intricate world of Bentley craftsmanship and the obsessive attention to detail that makes its cars so unique. I shoot a lot of the Bentley advertising images and had shot a lot of epic landscapes, so I was asked to come up with a way of achieving this new way of shooting. Gigapixel photography has been around for a couple of years but never used for product photography before. 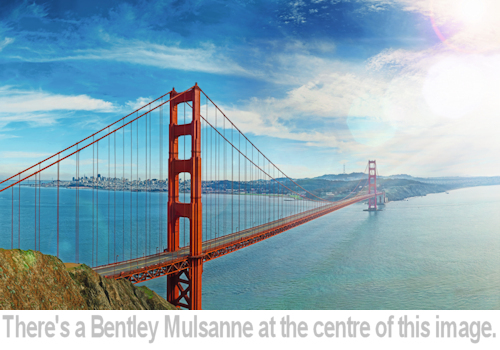 At 104 meters wide, this interactive panorama of the famous Golden Gate Bridge is so large that it could cover a football pitch, if printed out. But zooming all the way into the image reveals the embroidered Bentley badge on one of the hand-upholstered seats of the car. How did you select the equipment to shoot such a special image? 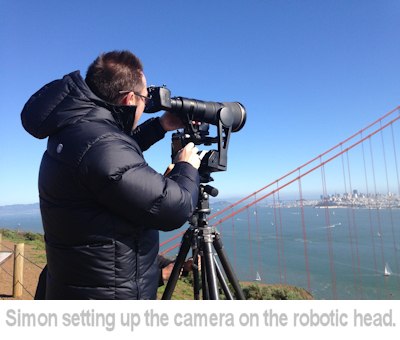 To capture the gigapixel images you need a computerised robotic head which you mount the camera on and it can be pre-programmed to capture the scene you want. We tested the different makes and settled on two systems which we used together. You’ve used NASA technology, can you describe the equipment you used? The robotic heads are using the same technology NASA developed for photographing the surface of Mars, which breaks the image down in to a number of captures which overlap. The amount of images needed is based on the focal length of the lens, the longer the lens the more images are needed. There must have been quite a learning curve to using such a system, can you tell us about it? The testing phase took quite a while as nobody had managed to achieve the level of zoom we were after. 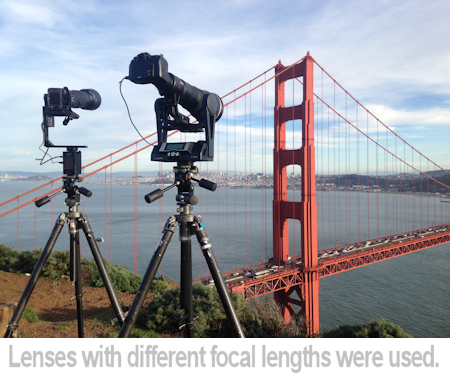 The normal gigapixel images allow a certain amount of zoom but not nearly enough to allow us to see the car details on the Golden Gate Bridge. I had to learn how to use the robotic heads and the software used to stitch the images together. The main challenge with the systems is you cannot see if the image has worked until you are back in the studio and have stitched the images together. One mistake in programming the sequence or not having critical focus can mean the day is wasted! The image, made up of 53 billion pixels and 700 images, zooms from a landscape vista to the stitched logo on the passenger seat, can you describe how you create such an enormous image? Three Nikon D810 cameras were needed to capture the entire photo and to keep everything in sharp focus, the lenses used ran from 200mm to 1500mm in length. But there were still physical limits to overcome. The further away from the car the camera was placed, the more dust and heat haze would obscure the camera’s view of the car, softening the image. And that’s before we discovered another crucial characteristic of the Golden Gate Bridge: it moves as the temperature and wind direction change. What pre-shoot preparation did you have to do? We tested the equipment in London to start with and then went to the Scottish Highlands and shot on a very picturesque bridge with a test car. Once we shot this, we knew we could make the Golden Gate Bridge shot work. How long did it take to create the 700 images? We arrived at midday and shot until dark, 8 hours approximately. Each set of captures took between two to four hours on a 500mm lens and much longer when the focal length was increased. It took a whole day just to process the result at full resolution, with technical consultant Simon Sledder modifying the software controlling the camera mounts mid-shoot. The most challenging part of the shoot was the weather as we were shooting in February and it was very changeable . The traffic flow on the bridge was also a problem as some days it was nose to tail congestion. The other issue we hadn’t foreseen was the bridge moves up to 27ft on a windy day so stitching together all the cables was tricky. On 2 days we had to cancel the shoot as it was just too windy to work. Why did you choose the Golden Gate Bridge in the USA to provide the scene? We wanted an Iconic bridge which was instantly recognisable. Post-processing so much data must have been a challenge. Can you describe the workflow? Post production, by Tony Swinney at London-based Mustard Post, was a big issue as no one had tried retouching such a large image. Photoshop has a size limit of 300,000 pixels by 300,000 pixels which we were over and this made simple things like colour correction, curves, etc, very time-consuming. We had to split the image into sections to work on it. The image would take up to 2 hours to open it on the highest spec Mac Pro available and an hour to save. Do you think this kind of imagery will become commonplace? I think there are a lot of applications for this type of photography and I am testing new ways of using it at the moment. It is a very exiting area which is open to innovation. In the final article from our series looking at Burnham Niker, owner Katy Niker gives us an insight in to the work of the photographers' agent.